Rabbi Sherre Zwelling Hirsch has a lovely article on prayer -- when, where and how -- in this week’s Jewish Journal of Greater Los Angeles. And everyday I actively seek to answer my rabbi’s question in my work and in my home. The answers have not yet come. But I pray that one day a student of mine will continue the search. It captures the tragedy of the Palestinians: what they could have had five years ago by negotiation they have now lost by war. And just as with each prior war, the map of a potential Palestinian state got smaller. Simply by saying “yes” in 1937, 1947, 1949, 1967, 1978, 2000 or 2001, the Palestinians could have had a state. Today, after a five-year Terror War, there is no longer any part of the Palestinian “no” that Israelis do not understand. I met General Nasser Youssef (who at the time of our meeting was head of one of the Palestinian security forces and is now the PA Interior Minister). At one point during our conversation, I asked the general to describe his vision of the relations between a Jewish state and a Palestinian state after we signed a peace agreement. Let's assume, I said, that Israel withdraws to the 1967 borders, uproots the settlements and redivides Jerusalem: What then? He replied that, once the refugees begin returning to the area, so many would gravitate to those areas in Israel where their families once lived, that eventually we would realize there was no need for an artificial border between Israel and Palestine. . . . But, I asked the general, aren't we negotiating today over a two-state solution? Yes, he replied, as an interim step. . . ."
This story is particularly relevant because General Youssef is widely known as a moderate, deeply opposed to terror as counter-productive to the Palestinian cause. And so what I learned in my journeys into your society is that moderation means one thing on the Israeli side and quite another on the Palestinian side. . . .
A Palestinian moderate . . . tends to disagree with the extremists about method, not goal: He opposes the destruction of Israel through terror and war, perhaps because that option isn't realistic; yet he advocates the disappearance of Israel through more gradualist means, like demographic subversion. Like General Yusuf, he sees a two state solution as an interim agreement, a step toward Greater Palestine. When your moderates speak of peace and justice, then, they usually mean a one-state solution. It is an important essay. QUESTION: What do you make of the statement by Hamas over the weekend that it's halting all attacks against Israelis? Do you welcome this statement? Are you taking it with a bit of skepticism? Do you think this is enough to calm the recent violence that happened over the weekend? MR. MCCORMACK: . . . What we have done is we have, over the weekend, been in touch with both sides, with Israeli officials, with Palestinian officials. We've urged all to help maintain an atmosphere of calm, free from violence. We have also made it very clear that these sorts of violent attacks, these sorts of terror attacks can't happen. And the Palestinian Authority has the responsibility. They have taken actions to try to prevent such future attacks; that is very important. It is important that they take up their obligations to stop terror attacks, to dismantle terrorist organizations. We also understand Israel's right to defend itself, but in taking actions to defend itself, we ask Israel to consider the effect that its actions may have on reaching the overall goal that all share of achieving two states living side by side in peace and security. The State Department contacted both sides not to use violence, after one of them did. State always reminds “all” of their obligation not to use violence. (It’s not clear why violence even occurs, since State has made it “very clear” that terror attacks “can’t happen”). State’s position is that Israel can defend itself, as long as it subordinates its defense to the “overall goal” of “two states living side by side in peace and security” (“2 States, S/S, in P&S™”). Apparently, 2 States, S/S, in P&S™ might be endangered by too much Israeli action against terrorism. Asked to provide “some examples of how the Palestinian Authority has taken action against Hamas” (since the PA “invited them into elections”) the State Department spokesman said “Well . . . they have taken some actions to maintain an atmosphere,” without specifying what the actions were. No actions involving any of the 50,000 PA “police” have yet been reported. The sad trainwreck unfolds. 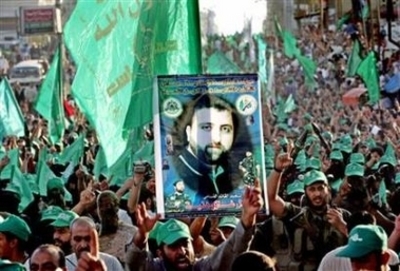 Hamas blows up its own parade through stupidity. Unable to lose face, Hamas rockets Israel from Gaza. Sharon, loathe to concede the Gaza withdrawal may have endangered Israel, will kill a score of terrorist leaders and hit the Palestinians in the pocketbook to show he's tough. That will get the “militants” all jumping up and down, while the PA teeters like a house of cards in a Category 4 hurricane and the peace movement hums an inspirational hymn indistinguishable from the shrieking of the wind. [T]he organization was propped up by the Israelis themselves, under the pressure of the world, as the representative of the Palestinian people. . . In reality, it was merely a mafia that had little internal legitimacy besides being the world sponsored monopoly. This could be done when Gaza was under outside (Israeli) control, [but] the UN and its affiliates can't do jack [once] the Israelis are gone -- they were the normalizing and deterring force. . . . Hamas or a derivative will be in control of Gaza before this is over. The real war hasn't begun . . . . The first political casualty of the Gaza withdrawal may be Sharon himself, if the Likud effectively impeaches him tomorrow. Sharon’s speech today to the Likud Central Committee is here. Netanyahu’s speech is here. Both are worth reading. The chaos of the Likud meeting is described here. At Power Line, Paul Mirengoff raises concerns about the appointment of Richard H. Jones as the new U.S. Ambassador to Israel. Jones had been serving as Senior Advisor to Condoleezza Rice and Coordinator for Iraq since March of this year. Before that, he served as Ambassador to Kuwait from 2001-2004 (serving concurrently from November 2003 to June 2004 as the Chief Policy Officer and Deputy Administrator of the Coalition Provisional Authority in Iraq), U.S. Ambassador to Kazakhstan (1998-2001), U.S. Ambassador to Lebanon (1996-1998), Director of the State Department’s Office of Egyptian Affairs (1993-1995) and Counselor for Political Affairs in the American Embassy in Riyadh, Saudi Arabia (1989-1992). He reportedly “knows none of the major politicians on either side of the Israeli-Palestinian dispute and has never been assigned to the issue, even in Washington” but has the confidence of Rice. More background on Jones is here. Jones was one of four ambassadorial nominees to appear before the Senate Foreign Relations Committee on July 27, 2005, in a relatively brief and perfunctory hearing. (The Committee did not publish a transcript of the hearing, but a Federal News Service, Inc. one is available on Lexis-Nexis). But a couple answers were possibly noteworthy. Your question is very thought provoking. My immediate reaction is that Israel may be a little bit of a different case than some of the other countries, in the sense that our efforts at bringing peace to Israel and helping it to create defensible borders, helping it to gain a comfortable space in the region that surrounds it is ongoing. . . . I do think there are things working in our favor to continue and to renew this relationship with Israel, particularly as we stand by Israel as it takes risks for peace, as we work to help them mitigate those risks, to help them achieve sustainable borders, to achieve peace with the Palestinians and also with their neighbors. But at the same time, there are demographic pressures growing in Israel. There is no question of that. There is a rapidly growing Arab population in Israel, and that is, I think, a segment of the society that we need to work on to build our relationship with them. And so there are also challenges in Israel. I think one of the possible strengths I bring to bear, although I’m a novice in dealing with Israel, I do speak Arabic. . . .
SEN. ALLEN: . . . Do you see your role as ambassador to Israel as one of using a bully pulpit to prod, encourage, push for progress on this area, the issue of terrorism? That more than anything else will of course foul up the so-called roadmap. Unless that is assured I think it’s very difficult for Israel to be able to have any confidence in some of the risky efforts they’re making. Not just in Gaza, I’m talking about other settlements on the West Bank. But do you see your role as a ambassador to be pushing for this action on the -- as far as pushing the Palestinians towards it? I’m just trying to figure out how you’re going to figure in on this team and your role. MR. JONES: Yeah, right. Well, obviously an ambassador has a very important opportunity to make public statements, and you can address a variety of audiences in those statements. I mean, as ambassador to Israel, my primary focus will be on speaking to the Israeli people. But . . . . you can rest assure [sic] that I am adamantly opposed to violence in all forms, especially extremist and terrorist violence. The State Department is an expert in adamantly opposing violence in all forms, without distinguishing whether it is offensive or defensive in nature, constantly reminding “both sides” of their “obligations.” Jones appears to have the lingo down: “risks for peace,” “adamantly opposed to violence in all forms,” etc. But as both Paul Mirengoff and Diana West note (here, and, even more forcefully, here) the real question raised by his appointment is what his superiors have in mind. Simon Wiesenthal was a survivor and a witness, who served -- who seared the horror of the Holocaust in the collective memory of the world. He's one of these leaders that refused to back down. He spoke with clarity. He insisted that we remember the lessons of the crime. . . . As we saw in the recent desecration of the synagogues in Gaza, the ancient hatred of anti-Semitism still burns in the hearts of men. . . .
[S]ince this storm, our nation's armies of compassions [sic] have rallied and have come to the aid of people who are in desperate need of help. . . And the Jewish community of this country has been on the forefront of the efforts. At Tulane University, the Director of the Chabad, Rabbi Rivkin, brought teams of students to New Orleans, and southern Mississippi, and other communities hit by the storm. He called in folks to help. He didn't say, head away from the storm; he said, let's take it right to the middle of the storm area to help people. They helped rescue stranded people; they distributed bottled water and self-heating kosher meals; they cleaned up and helped salvage homes; they provided spiritual support for those who lost loved ones. . . .
Jewish organizations have thus far raised $17 million to help the victims of Katrina. (Applause.) Our citizens are answering the call of the Prophet Isaiah: "If you give what you have to the hungry, and fill the needs of those who suffer, then your light will rise in the darkness, and your darkness will be like the brightest time of day." . . . .
Sam mentioned the time when the RJC flew four governors -- and I happened to be one -- to the Holy Land. And we went to a briefing by the government of Israel then, and one of the Cabinet members was Ariel Sharon. And after the briefing he introduced himself. He said, would you like to go on a helicopter ride and take a look at the West Bank. I said, "Are you flying?" No -- (laughter.) I said, you bet. It's interesting how history works, isn't it? In 1998, fall of 1998, the future President of the United States and the future Prime Minister of Israel were flying across the -- across that country, with him describing to me how to keep Israel secure. A couple of lessons I took away from there -- is, one, you know, how tiny the country is. You know, a guy from Texas, we got a lot of space there -- there's not a lot of space there. How vulnerable Israel can be. . . .
You know, in our response to terror and tragedy, we have seen how great suffering can awaken an even greater love -- and we've been reminded there is no evil from which our Creator cannot draw forth greater good. . . It's such an honor to be the President of a country that not only deals with our adversity, but is able to create good out of the adversity we face. And the reason why we're able to is we've got a indomitable spirit, and we've got a land full of people that are incredibly generous and strong and compassionate. And I appreciate being in a room full of such people. Suppose someone were to come to me, after reading the papers last week, and say -- Look: No sooner did Israeli troops leave Gaza than mobs began to loot and destroy even the greenhouses that had been left there as part of their agricultural infrastructure. The police of the Palestinian Authority, who had ample warning of the deadline, managed to post a total of 70 policemen at these valuable sites, who could do no more than stand by as people scavenged and stole. The synagogues left behind by the settlers, which the Israelis were too squeamish to destroy, could perhaps have been preserved for a day or so until a decision was made about what to do with them (a museum, perhaps, or even a school -- religious buildings have no special sacredness for me), but they were simply and viciously torched. Gangs of ruffians and blackmailers roam Gaza unchecked, and even tolerated, and prey upon their fellows. Clerical extremist parties flourish their banners and mouth fearsome oaths and slogans. The promise to respect the border with Egypt is void, and smugglers and mobsters laugh at the authorities. So, now how do you like your Palestinian state? My reply would be that this doesn't alter the case. It breaks my heart, but it doesn't alter the case. Well, it sounds like five strikes to me. If your “police” can’t protect valuable property, if you torch buildings that could be used as a museum perhaps, or even a school, if gangs roam the land unchecked and tolerated, if clerical extremist parties are similarly encouraged, and if solemn undertakings are void one day after they became effective, I’d say -- yeah, I don’t like your Palestinian state. The right of the Palestinians to a homeland and flag and passport of their own is in the first place inalienable, and in the second place enshrined in many U.N. resolutions as well as in the pledges (moral and monetary) made by European and American statesmen. The fact that this cause was represented for so long in the person of a thief and dictator and fantasist (and admirer of Saddam Hussein), a man well-described by Edward Said as "the Papa Doc of Palestine," doesn't change this essential point, even though everybody should read David Samuels' absolutely arresting profile of the late Yasser Arafat in the September 2005 issue of the Atlantic Monthly. Still, when one considers how many lives have been pointlessly lost in the last decade of the Israeli-Palestinian confrontation, and how many billions upon billions of international donations have been poured down a rathole and used for the greasing of the nastiest palms, a certain feeling of depression is inevitable. I’m sorry, but those are strikes six through ten. The right to a state is obviously not inalienable; it didn’t even exist when Jordan and Egypt ruled the West Bank and Gaza. Why Egyptian and Jordanian passports were fine for 50 years, but are now an “inalienable” right, is not self-apparent. I don’t think it is necessary to comment on the sanctity of “many U.N. resolutions” as the purported source of the rights of man. I would not think the fact that the people followed for decades a leader who was a “thief and dictator and fantasist” -- and build monuments to him after his death -- is an argument for a state, but rather the opposite. And there is only one intelligent response to “billions upon billions” that were “poured down a rathole.” Enough is enough. But have I heard anybody say that the whole thing's obviously a waste of time and resources, and the Palestinians should therefore be abandoned to their own devices? No. Well, you heard it here: Yes. Wake me when they start their "sustained, targeted, and effective operations to . . . dismantle terrorist capabilities and infrastructure." Last week in Gaza was one of those events that clarify the mind. It provided practical evidence in the place of theoretical arguments. The proper response is not a certain feeling of depression, but a re-thinking of the inalienable rights of terrorists. Before dawn yesterday, Palestinian gunmen climbed on the roof of the Netzarim synagogue and raised flags of militant groups. They chanted, "God is great," and "We don't want anything to remind us of the occupation." They then set the Netzarim synagogue ablaze. Palestinian police stood by and watched, admitting they were outnumbered by the crowds and had little motivation to stop them. Abbas, in honor of the completion of the Israeli pullout from the Gaza Strip . . . declared, "From this day forth, there will be no more security turmoil and weapons chaos and abductions, which are not characteristic of our culture." . . . .
On the eve of the IDF withdrawal, when Israel closed the Rafah crossing, Palestinian Minister Mohammed Dahlan, who was in charge of coordinating the withdrawal, said the Palestinians were ready to deal with any scenario and would not accept external pressure regarding traffic to and from Gaza. The collapse of the Gaza-Egyptian border in the three days since Israel withdrew from the Strip, which has allowed thousands of Palestinians to enter Sinai and numerous Egyptians to enter Gaza, is extremely worrisome to Jerusalem. Israel is fearful not only of massive arms smuggling into Gaza, and consequently to the West Bank, but also, and particularly, that Al-Qaida operatives will be able to enter Gaza freely. . . .
[L]arge quantities of rocket-propelled grenade launchers were brought in. It is also known that various organizations -- not only Hamas, but also the Palestinian security services -- had large arms caches in Sinai awaiting an opportunity for them to be smuggled over the border. Palestinian security forces are doing little to combat the illicit traffic, and nothing has been done yet to seal the gaps along the border made by Hamas activists. 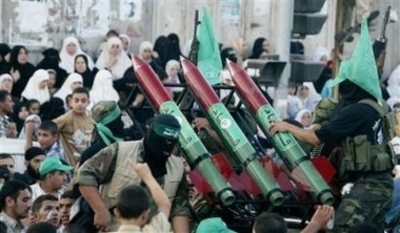 Israel's security establishment believes the terror organizations have smuggled in weapons that upset the balance of power, in particular long-range Katyusha rockets and Strella antiaircraft missiles. Military sources admitted they have no credible intelligence information, but said hundreds of rifles and hundreds of thousands of ammunition rounds have been brought in, and it is highly likely that antitank missiles have also reached Gaza. More pictures here: essential viewing. UPDATE, in response to Yael’s perceptive comment below: There already is “one gun and one authority” in Hamastan, held by the group after whom the country is named, as today’s march demonstrates. Thousands of Hamas militants paraded with weapons through the streets of Gaza City on Sunday in the group's largest show of force in years, defying Palestinian efforts to ban public arms displays. . . .
Hamas leaders vowed to continue fighting Israel as tens of thousands cheered and waved the group's green flags and masked gunmen hoisted assault rifles, rockets and anti-tank missiles. The demonstration, which Hamas called its largest armed protest since its founding in the late 1980s, openly defied Palestinian President Mahmoud Abbas who vowed in a speech last Tuesday he would not tolerate the "chaos of weapons". Abbas’s role is not to disarm them (he might look down at his papers, though). His role is to receive land, money, prisoners, greenhouses, and other concessions from a credulous world. Weakness is his strength, and also his strategy -- something he adopted a long time ago. Yael’s post today shows what’s coming next. The Page One Feature this week in The Jewish Press analyzes Ariel Sharon's recent statement (on the eve of the Gaza withdrawal) that he had "reached a deal with the Americans." What, exactly, was that deal? What did Israel receive for its disengagement plan? And what -- since Israel has now carried out its end of the bargain -- does the United States owe Israel? The public record of the deal is the April 14, 2004 letter from George W. Bush. Most attention has focused on two statements in that letter: (1) it “seems clear” Palestinian refugees must be resettled in a Palestinian state rather than Israel, and (2) it is “unrealistic” to expect a complete Israeli withdrawal from the West Bank, in light of major Israeli population centers there. But the heart of Sharon’s deal is not in those two statements. It is in three express assurances -- contained elsewhere in the Bush letter -- representing formal promises by the United States to Israel. The significance of those promises has not been widely appreciated, perhaps because they cannot be fully understood without reference to Sharon’s letter to Bush dated the same day, and other matters external to the April 14 letters themselves. But if these sources are considered together, the deal Sharon made becomes clear.